What follows is an analysis created in the style of Jules David Prown, a material culture studies expert who focuses on the reading of objects, starting with a close reading of the artifact, gradually widening the focus of the study to encompass broad strokes of culture, theory and critique. References to Prown and Kenneth Haltman appear as notes to the insider, but know that this work stands on its own—one need not possess an understanding of Prown or Haltman, or any of the critical theory given as reference to digest the concept of reading this everyday object in a wider, more conscious context. This Multimodal Object Analysis was the capstone project of the semester-long study of material culture and expository writing. I set out to craft an essay that was both multimodal and expository, with the work of Jules David Prown as my model. Prown’s work in material culture studies informed much of the direction my writing took in this essay, in that, Prown takes a microscopic approach of focusing-in on the object of study and then gradually widening the focus outward, eventually reaching some more universalized points of conversation on the culture that produced the object. Above all, writing this project proved to be an educational experience—before this work, I was unaware of the issues around conflict minerals in smartphones as they relate to African strife and how this also correlates directly with the working conditions inside Chinese factories. The artifact appears as a soft rectangular solid of black, silver, and grey- cast in aluminum, glass, and hard plastic. The body of the object is covered in a shell of light blue rubber and hard, medium-blue plastic, measuring 2.31 inches wide, and weighing 4.9 ounces. Its depth measures 0.37 inches, and the object is 4.5 inches tall. On the front mirror black surface of the object, near the bottom, there appears a slightly recessed circle, perhaps a button, with a white square inscribed on the center, measuring no more than a half-centimeter or so on each side. Near the top of the façade there is a rectangular shaped recession, with grey mesh at its base. Adjacent to the grey mesh, sits a tiny circular lens. On the east vertical side of the artifact, there are what appear to be two buttons, labeled “+” and “-”, and a switch which can be shifted upward or downward. When shifted downward, the switch reveals an orange rectangle of color above it. The west vertical side of the object remains flush, lacking any modifying attributes. The south vertical side features two small grey mesh ovals, two tiny screws, and an opening shaped like a rectangle, which appears to be an electronic female plug. The north vertical side features one oval shaped button and one circular opening which also appears to be a female electrical port of some variety. “iPhone…Designed by Apple in California…Assembled in China…Model A1387…EMC 2430…FCC ID: BCG-E2430A… IC: 579C-E2430A. Engaging with the object yields the discovery that this rectangular solid is in fact an interactive electronic device, likely to be used for communication, given the inscription on the rear, “iPhone.” Pressing the oval button on the north vertical side activates the front black-mirrored glass to reveal the date and time, a directive at the bottom, “slide to unlock,” two small digital oval buttons at center top and center bottom, and a camera icon in the bottom-right corner of the space. An airplane, a WiFi symbol, a Bluetooth symbol, a moon symbol, and a symbol with a lock circumscribed by a curved arrow. Below these buttons is a sliding scale brightness control, with a sun emitting small rays on the left side and a sun emitting larger rays to its right. Beneath that bar lies a sliding scale controlling volume: a spectrum bookended by a speaker symbol on the left, and a speaker symbol on the right, emitting sound waves. At the bottom of the screen, 4 more buttons appear, revealing the tools they represent: a flashlight, a clock, a calculator, and a clock. At the top of the screen, a status bar sits, indicating the level of connectivity, the service provider’s name, Virgin, and the form of service connectivity, 3G. To the right of this information, a tiny alarm clock, a faded Bluetooth symbol, the figure 75%, and a battery-shaped icon (the battery being ¾ full) appear queued. Contacts, Notes, Weather, Wells Fargo, Calculator, Maps, Podcasts, Spotify, Music, Clock, Settings, and Safari. Phone, Messages, Calendar, and Gmail. Two circles, one white and one grey, appear above the bottom row. Swiping the finger to the right on the first screen reveals a second screen with similar applications to the first screen. Having focused on the physical attributes and the functions of the object, we can move from description and speculation to deduce that this object is indeed a version the Apple iPhone, a smartphone manufactured sometime after October 2011, making the device an expression of, more or less, present day culture. Here’s Apple’s Trailer for the iPhone 4s. This kind of analysis gives a backbone to the seemingly disembodied polarities and object metaphors that Haltman introduces as part of Prown’s analytic style. The minimalistic design resists a loud projection of metaphor like Prown’s teapot: almost no one could call an iPhone “grandmotherly” or “comforting.” I have noticed in my own work, the analogy of the smartphone as a parasite. As a bartender, I’ve observed friends and couples out to lunch or dinner together. At some point, the conversations diminish, and I see the people drift away into the illumined faces of their devices. The objects that were designed to foster creativity and ease of communication seem to have created a precipitate and inverse reaction in the user: a sense of distraction and alienation. I may be making a generalization based on my cursory observations in the workplace, but I believe this example to be an object lesson, illustrative of a trend in culture towards a compulsive relationship to mobile devices and the Internet. As pendulums are wont to do, they swing between polarities, and I believe we’ve seen the extremity of over involvement with our gadgets, that over involvement being the causal event for the age of loneliness. The muted features of the iPhone- the rounded sides, the relatively light and thin body, suggest that the object should seamlessly assimilate into a person’s life. Furthermore, the sleekness and lack of moving parts indicates that the object would basically be invisible. One could leave it in a pocket or bag and forget about it, thus allowing the iPhone to almost become part of the body. This idea of the iPhone diverges wholly from older concepts of the telephone in many ways- early phones existed as stationary objects, mounted to a wall and hard-wired into the circuitry inside a building, making the object much less personalized. The evolution of technology from early telephone concepts leading up to the moment in time represented by this object shows a reshaping of the form and the role of the telephone in culture. The major shift is that of purpose: the telephone was a device for communication. Early cellular telephones, car phones, and pagers were devices made to enable interpersonal communication. While the smartphone is a device for communication, it is also a device for entertainment, advertisement, shopping, and distraction. The iPhone is a type of status symbol, unto itself. There are those who have iPhone and those who do not have iPhones. The values of the Apple Company imply creativity, business savvy, and an admission into a type of status of cool in the products they sell, creating a binary dynamism between those who buy-in to the Apple lifestyle and those who do not. The culture of Apple and the sensationalism surrounding the iPhone brand calls into question the binaries produced from a sense of having and not having. Examining these binaries could look towards a Marxist critique examining the relationships between producer and consumer and the labor value represented by the object. This evokes that masking of how and by whom an object came to be under a social value of the object in question: people want the iPhone, but, oftentimes, they don’t know how or by whom the iPhone was made. Part of this snapshot of history the iPhone 4s offers is a look at the structural issues inherent in the high demand for smartphone technology. Art and culture have begun responding to the economic and social ramifications of the technology. “Ruined” by Lynn Nottage, a play about the violent situation in the Congo, partially brought upon by the mining of a rare-earth mineral, Coltan discusses issues that are precipitate to an increased demand for mobile technology. Coltan is refined into a powder and used in cellphone technology to keep devices from getting too hot. Image by Dizolele. Coltan Mining. Coltan is a key ingredient in the fabrication of iPhone circuit boards. Nottage’s work connects the sexual violence perpetrated against women in the Congo as a precipitate of these internal social and political conflicts, which arose in part, to the rising demand for cellphones to be manufactured and sold in the western world. The aim of a material culture analysis of any object should illuminate revelations about the culture that produced said object. The culture of American iPhone users is but only one aspect of the greater picture, as iPhone labor is outsourced, therefore globalizing the artifact. In order to get a clearer picture, it is important to examine the world of those involved in the manufacturing process as well as that of the end users. The situation of the laborers creating Apple products has been something under scrutiny in recent years. At the Chinese plant, Foxconn, journalists have exposed sweatshop conditions. An outbreak of suicides in the Foxconn plant, which produces some of Apple’s products, deepens the concern over the human cost of manufacturing luxury items. These disturbing facts have a contradictory and interrupting effect when taken into view along with the aesthetics of the brand: a paradox between a projected image and a gritty reality. From Daily Mail. 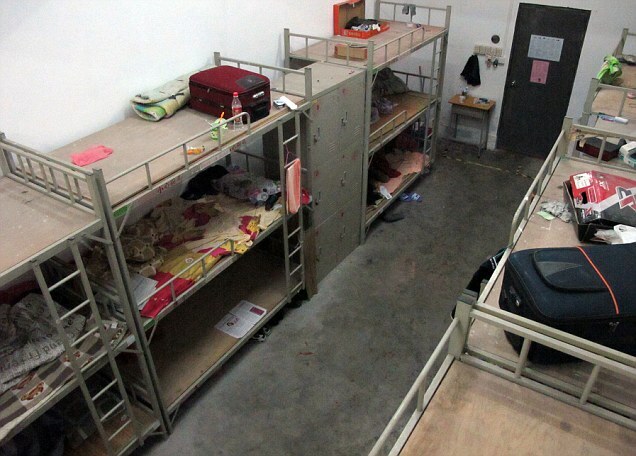 Workers’ quarters at Foxconn. From China Divide. Workers at the Foxconn Plant where Apple products are made. Juxtaposing the images of violence to the images of sensational consumerism raise an eyebrow to the notions of ethical consumption. How can today’s modern consumer , whose identity to some degree, has been acculturated into the use of these kinds of technology, move forward and make decisions about their own consumption– by understanding that purchasing any object supports and reinforces the existing relationships being negotiated among: the planet’s resources, the laborer who helped to produce the goods, the facility which produces the object, the parent company, the industry that transports the goods, and the retailers who sell the objects. Even if one does not agree with a Marxist critique of capitalist consumption, it is possible to take into consideration that, working within the system, one can make an informed effort to purchase ethically sourced objects with an understanding that many of the structural issues that underlie the situation will only change at a glacial pace. Staring at the muted lines of aluminum, glass and hard plastic, one begins to drift. So much progress, theory, branding, marketing, research, blood, coal, steam, man hours, industrial processes, fire, iron, despair, hope, innovation, and synergy all play into the formation of something that tries so hard to be invisible. The fact of life for many Americans in 2014 is that smartphone technology is second nature. Most people would never consider giving up the convenience of the mobile phone. Many of our jobs require them. Family life evolves and we need these objects to navigate many aspects of relationship. Our relationship with technology, however, is worthy of consideration: how many hours per day, per week is enough? The beauty and simplicity of the minimalist design obfuscates the reality behind the iPhone. The culture that produced the iPhone reveals some of the paradoxes of the human experience: luxury juxtaposed next to poverty. Wealthy Americans sleep in cardboard boxes, by choice, camped out to buy the latest iteration of a new product– poor, disenfranchised people in America and abroad sleep on the ground or on a cold hard floor out of necessity, and maybe never get enough capital to afford a smartphone. The paradox of alienation- a product designed to make life easier and relationships more accessible leads many users to a lonely place. The price tag of $0 for the free upgrade on a cell contract with a major provider doesn’t reflect the human and environmental cost of production of the object. Consider the blank faces of couples dining, absorbed by artificial light. Bringing into the associative notions of business ethics, ecology, violence, philosophy, and pop culture conjures an image of the iPhone that I hadn’t really understood before now. Although the piece might arouse some strong emotions, the work is meant to be an object lesson about material culture, not merely a counter industrial polemic. That might be the biggest concern I have for the work as a whole. My next thought about this whole web of relationships is this: the iPhone is just one of millions of items produced in this contemporary industrial consumer market. I synthesized some ideas some on one little corner of this bigger situation. I don’t mean to vilify Apple, but merely to show something about the culture that produced the artifact. Barboza, David and Charles Duhigg. “In China, Human Costs are built into an iPad.” The New York Times. 25 January 2012. http://www.nytimes.com/2012/01/26/business/ieconomy-apples-ipad-and-the-human-costs-for-workers-in-china.html?_r=2&pagewanted=all& Web. 03 December 2014. Belk, Russell W. “Possessions and the Extended Self.” Journal of Consumer Research, Vol. 15, No. 2 (September 1988), pp. 139-168. The University of Chicago Press. http://www.jstor.org/stable/2489522. 15 December 2014. Belk, Russell W. “Extended Self in a Digital World.” Journal of Consumer Research, Vol. 40, No. 3 (October 2013), pp.477-500. The University of Chicago Press. http://www.jstor.org/stable/10.1086/671052. 02 October 2014. Web. Benjamin, Walter. “The Collector.” The Arcades Project. Harvard University Press. 1999. Print. iPhone 4s Tech Specs. Apple.com. Apple. http://www.apple.com/lae/iphone-4s/specs/ . 02 October 2014. Web. “iOS 8.” Apple.com. Apple. http://www.apple.com/ios/. 02 October 2014. Web. Merkel, Jim. Radical Simplicity: Small Footprints on a Finite Earth. Canada: New Society Publishers. 2003. Prown, David Jules. Fact or Fiction. History from Things: Essays on Material Culture. Eds Lubar Steven, and Kingery, W. David. Smithsonian Institution Press. Washington. 1993. Print. Silverman, Matt. “Users For Sale: Has Digital Illiteracy Turned Us Into Social Commodities?” Mashable. 30 June 2011. http://mashable.com/2011/06/30/users-products-rushkoff/ 02 October 2014. Web.